Patrik Lindström EBM, Electro The brand new Dupont EP is here and it's called 'Dope of Love' and is taken from their latest album 'Entering the Ice Age'. First of all, I must say that I think it's kind of far fetched to call this an EP. I'm well aware of the fact that labels often call their smaller releases for EP's (often by squeezing in a bunch of remixes), since they have figured out that EP's sell better than CDS, but this is no EP, with an A-side, a B-side and a remix, this is surely a single. End of story. So, how is this SINGLE then? Well, actually very good. The 2010 version of the track is sure enough an improvement of the original track. It's been polished like grandma's favourite marble and in this version I think it truly shines. The time they have invested in this track have made this into a great dance floor hit. The B-side is called "Cannonball" and here the tempo is slower and the music is much more monotone. It got this absent minded feeling to it and I must say that it is an alright track, but not a favourite in the long run. The remix of the title tune is made by Daniel Myer and it could have very well been called "Slowmotion Remix". Sure enough, there are some other changes, but in general, it feels just like the original track, but simply much slooooooooooower. Too slow in my opinion. If the 2010 version is a youngster in his early 20's, this version is somewhat like being kicked off to the elderly home, even though it catches up during the last minute like the last wheezing breath. 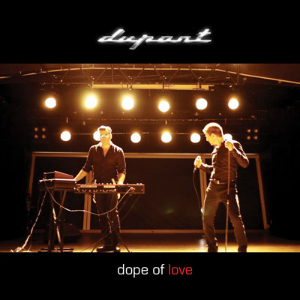 The brand new Dupont EP is here and it's called 'Dope of Love' and is taken from their latest album 'Entering the Ice Age'. First of all, I must say that I think it's kind of far fetched to call this an EP. I'm well aware of the fact that labels often call their smaller releases for EP's (often by squeezing in a bunch of remixes), since they have figured out that EP's sell better than CDS, but this is no EP, with an A-side, a B-side and a remix, this is surely a single. End of story. This is a good release all and all, where the 2010 version of "Dope of Love" makes up for the lacking of the B-side and remix.